Ever get annoyed when you are trying to type something quickly on the Nokia N9? I do… and despite all the advances Nokia has made to the virtual keyboard on the N9, a VKB will NEVER really be able to replace a real keyboard, miniature like the N900, somewhat shrunken like most Bluetooth keyboards, or especially a full sized keyboard. So, here’s a somewhat… well… strange workaround. I haven’t really played around with the settings yet, mainly because I don’t have the need to. Essentially, the only thing you’ll want to modify is the password – everything else, for all intents and purposes, should work just fine. 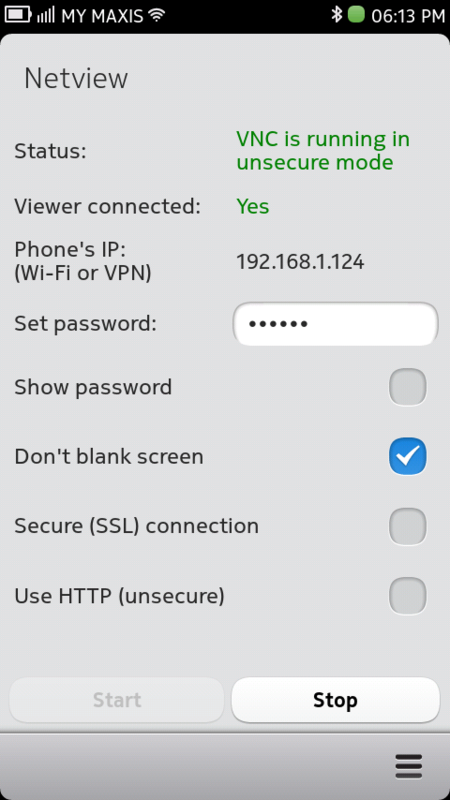 So, after setting up your password, tap the start button, and the VNC server starts up on the IP displayed on the screen. If you notice in the screenshot, I’m on a WiFi connection; I haven’t done any testing to see how much data is transferred but I wouldn’t recommend trying this on a 3G connection – a) latency b) you might get a bill shock at the end of the month c) your provider may not even give you an externally reachable IP. So, moving along, start up your favourite VNC client on your PC/Mac/etc., fill in the relevant details, and connect… SHAZAM!!! 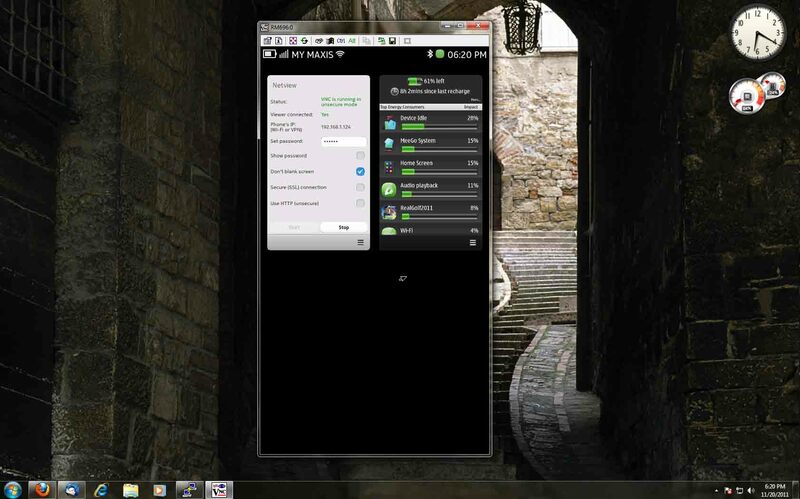 So, here we have our N9 UI in a VNC client on the PC. Now, not everything works… I’m having some difficulty unlocking the device from the VNC client, refresh is somewhat slow clientside, and other small niggly issues, but it’s generally useable. Best part of VNC-ing in to your N9? You can type on your normal keyboard. Texting, email, and various other keyboard centric tasks become a whole lot easier (and you forget to curse Nokia for not releasing the N950 to the public for awhile). This entry was posted in Uncategorized and tagged N9, nokia, vnc. Bookmark the permalink.